Auburn Harris Courtyard has apartments for rent in Brookline that have been recently refreshed with tasteful renovations in keeping with the timeless elegance of the classic brick apartment building. Each one- and two-bedroom apartment has original hardwood floors and crown molding. You won’t have to pay extra for heat, hot water, 24 hour maintenance response guarantee, or our convenient online rent payment system -- they’re all included with your apartment rental. These Brookline MA apartments are on a tree lined street just off of Coolidge Corner and the Longwood Medical Area, within walking distance of shops and restaurants, and close to public transportation and the Green C and D lines. 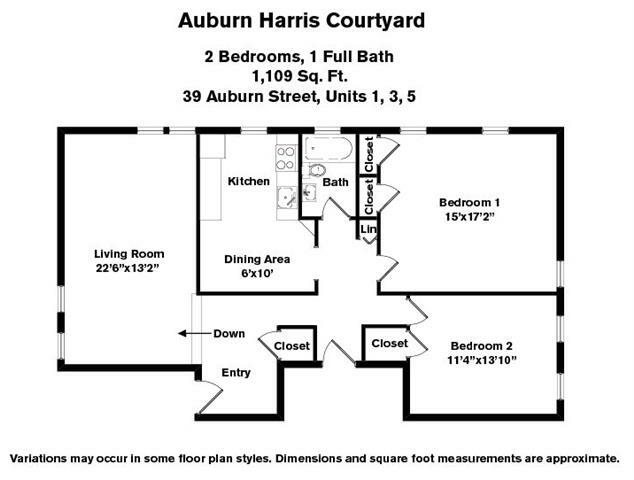 Look no further for an apartment for rent in Brookline known as the Auburn Harris Courtyard. Auburn Harris Courtyard apartments in Brookline, MA, have the desirable distinction of existing in an urban environment with a suburban feel. Situated on a tree-lined street in the Greater Boston area, Auburn Harris Courtyard apartment homes are within walking distance of upscale shops, boutiques, restaurants, health clubs, and major retail centers, including Brookline Village, Washington Square, Coolidge Corner and Cleveland Circle. The apartments for rent are also close to parks, playgrounds, and a variety of cultural institutions. Our Brookline apartments for rent are well-served by public transportation. Auburn Harris Courtyard is located in close proximity to the green C and D lines. Commuting to nearby Boston’s cultural, business, and academic institutions is as simple as taking a ride down Route 9 or the Mass Pike. For added convenience and another transportation option, it’s an easy walk to access a Zipcar. Auburn Harris Courtyard received a score of 95 out of 100 from WalkScore, an independent national survey that rates walkability in regards to a property’s convenience and access to local amenities. Being within easy reach of Boston is not the only benefit of living in a Brookline apartment rental. Brookline itself is esteemed for its public education system.. In addition to high quality schools, the Auburn Harris Courtyard apartments are near Coolidge Corner and the Longwood Medical Area. Residents of Auburn Harris Courtyard apartment homes enjoy the highest level of service and convenience. Free heat and hot water is included with every one and two bedroom residence. Those who live in our Auburn Harris Courtyard don’t have to worry about writing checks, since rent can be paid easily and quickly online. Every Brookline apartment for rent comes with a 24-hour maintenance response guarantee. Any repair-related issues are quickly addressed by our highly trained staff. The staff is focused on responding to your needs in a prompt, professional manner. Selecting an Auburn Harris Courtyard apartment home allows residents an unmatched level of service and convenience. I've been living at Auburn and Harris for 3 years now and really love my apartment and appreciate living with a company like CHR. I can walk to Coolidge Corner from my apartment as well as living right near the T which makes the location unbeatable. The entire maintenance staff is really great as well. I've had only a couple of small issues, but they have always come over within a day to fix them. I highly recommend it here. I have lived with CHR for almost 10 years now and can't imagine going anywhere else. I know most of the staff by name and always get great service when I need it. They really care about their residents and it shows in everything they do. With CHR's brand new RENTCafé, you now have 24 hour access to everything happening in your apartment community.